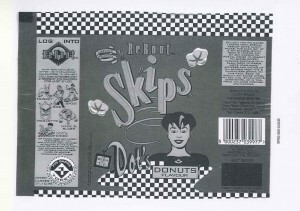 Thank you for contacting us concerning Donut flavoured KP Skips. We can confirm that we did produce these and that they were discontinued quite a few years ago and are unlikely to be manufactured again. Before any product reaches the shelves, extensive and costly product development and research is undertaken. Only a small percentage of new product concepts reach the retail outlet and even then, products may easily fail to gain the necessary appeal. Sadly, therefore, some products are removed from sale after only a seemingly short time. However, a longer manufactured product may also be discontinued due to a falling off of popularity, resulting in it no longer being a viable product to produce. But this wasn’t enough for us, so I asked if they had any images and they came back with this photocopy found in the cupboard. Which meant that Simon was right all along. Finally, proof that these crisps did exist.